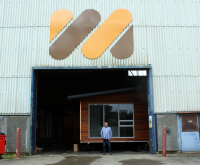 Matrix Homes, the Trentham-based company operating from the old General Motors factory is about to enter the high-rise market offering steel frame modular construction for hotels and apartment buildings. This follows them signing a contract to partner with Alto Australia, a company with 30 years’ experience in large-scale modular multi-storey projects all over Australia. Matrix Homes’ managing director Sean Murrie said, “Matrix expects to announce New Zealand’s first modular construction high rise building in the first quarter of 2017. This project will use the steel frame modular construction system developed by our partners Alto Australia. The Matrix/Alto Australia system uses steel framed load bearing modules, dispensing with the need for the building to have an independent structural frame. These modules can be stacked like building blocks to create multi-storey buildings of up to 10 levels in New Zealand. Building the modules at Matrix’s Trentham factory takes the bulk of the building indoors and allows work to continue irrespective of the weather. This saves time as site works take place at the same time. As soon as the site works are completed, the modules are trucked to the site, craned into position and bolted together. Once the modules are secured, the façade and roofing is attached and services connected. Matrix says that it takes only two weeks to install the modules for a six-floor building and that the entire build can be completed in less than 3 months. The company also claims that multi-storey modular buildings have lower maintenance costs, and better seismic and acoustic performance than traditional builds. Sean Murrie said, “Our modular high rise system provides savings of up to 25% over conventional building methods, produces less material waste and a much safer work environment. “This enables developers to build in the current market and avoid exposure to escalating building costs that industry sources recently claimed saw between 22 and 35 multi-residential projects axed in Auckland over the past 12 months. “While rising construction costs are not the only reason many construction projects aren’t proceeding, clearly there is a need for greater innovation that will result in a less costly, faster and better performing built environment. Matrix Homes reports that they have produced 60 stand-alone homes to date and while they could continue to doing so, Council bureaucracy around consenting and a lack of consistency between territorial local authorities make multi-storey projects a far more attractive proposition. “Each and every housing consent with Councils is hard fought – the territorial local authorities are getting in the way of building affordable housing and we would prefer to focus on multi-storey modular where our efforts aren’t stymied at every turn. “The Matrix/Alto Australia modular system provides an innovative solution to the ever increasing cost of building multi-storey buildings without compromising quality. It meets or exceeds all wind and earthquake standards, and provides superior fire protection. This makes the system ideal for hotels, apartments, and student accommodation. “We believe modular multi-storey construction also creates an opportunity to expand our business and workforce to deliver bigger projects that will improve our built environment,” Sean Murrie said. Original generation time 1.5165 seconds. Cache Loaded in: 0.0003 seconds.